Another powerful approach for investigating polytene chromosome organization is to precisely localize proteins in bands, interbands, and puffs. For this purpose, the method of indirect immunofluorescent (IF) analysis is widely used. However, the potential of IF labeling is limited by the low resolving capacity of the light microscope. Overlapping of the fluorescence signals makes it difficult to finely localize antibodies in the loose regions of polytene chromosomes, which are, as a rule, composed of a series of fine bands hardly discernible under the light microscope. Some of the bands, the so-called minibands, are recognizable only at the ultrastructural level. Similarly, fluorescence signals cannot be resolved in regions where closely situated large bands are separated by fine interbands. There was a growing realization that such difficulties might be overcome by using electron microscopy. Assurance was provided by the localization of RNA polymerase B (27), acetylated isoforms of histone H4 (28), as well as a 74-kDa acidic chromosomal protein (29) by immuno-EM methods. To improve and simplify the method, we attempted to localize a number of proteins specific to puffs, interbands, and bands, using conventional IF methodologies (30) in combination with the pre-embedding technique for gold-conjugated antibodies (see Subheading 1.3.). An example of its potential is presented in Fig. 6. We used monoclonal antibodies against the Z4 protein, which is located presumably in interbands (31). Our experiments confirmed this conclusion (see Fig. 6) as well as the absence of Z4 from the regions of large puffs. High specificity, discrete localization of immunogold label, and its conformity to IF patterns were shown for a number of other antibodies against different proteins distributed in fine bands, puffing bands, and puffs (i.e., in loosened chromosome regions). This method is described in Subheading 3.4. In contrast, our attempts to detect proteins in dense bands using the immunogold EM method were unsuccessful. For example, using the IF technique, the SuUR (Suppressor of Underreplication) protein was localized to the bands of intercalary hetero-chromatin (32). Overexpression of the gene encoding SuUR in the GAL4-UAS system produced intensive IF staining of the majority of dense bands (see Fig. 7A,B). However, immunogold EM analysis of SuUR showed the gold particles to be distributed over the edges of the dense bands; the label was absent from the internal parts of these bands (see Fig. 7C). Similar results were obtained when antibodies against other proteins known to be associated with these bands were used. Fig. 6. Immunolocalization of the Z4 protein in the 100AC region of the 3R chromosome: (A) immunofluorescence, (B) phase contrast, and (C) immunogold EM images. Scale bar: 1 |im. 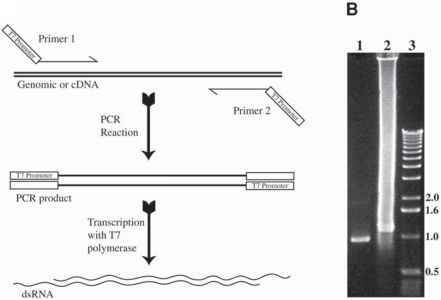 Taken together, these results indicate that the immunogold EM method did not enable detection of proteins in the dense regions of polytene chromosomes. Antibodies conjugated to gold particles apparently cannot penetrate into the compacted structures. Antibodies can interact only with the surface of the band, where they remain bound. A similar observation was made in our EM in situ hybridization study of digoxygenin labeled probes of band DNA (see Subheading 1.3.). Finally, it seems that antibody molecules may also become nonspecifically bound in loose chromosome regions. 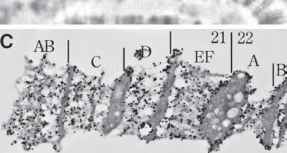 This is evidenced by the weak fluorescence shown by such regions and their labeling in ultrathin sections. Fig. 7. Immunolocalization of antibody against the SuUR protein in the 21DE region of 2L chromosome 2L. The SuUR gene is overexpressed in the GAL4-UAS system: (A) immunofluorescence, (B) phase contrast, and (C) immunogold EM images. Scale bar: 1 |m. and puffs. 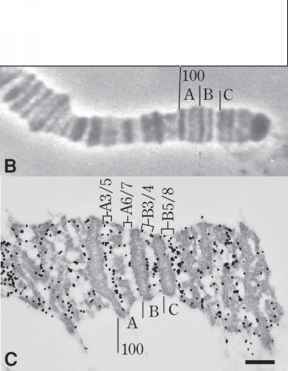 It is known that intense transcription of polytene chromosome sites is accompanied by band decondensation and puffing. Therefore, the immunogold EM method is suitable for localization of proteins involved in transcription.